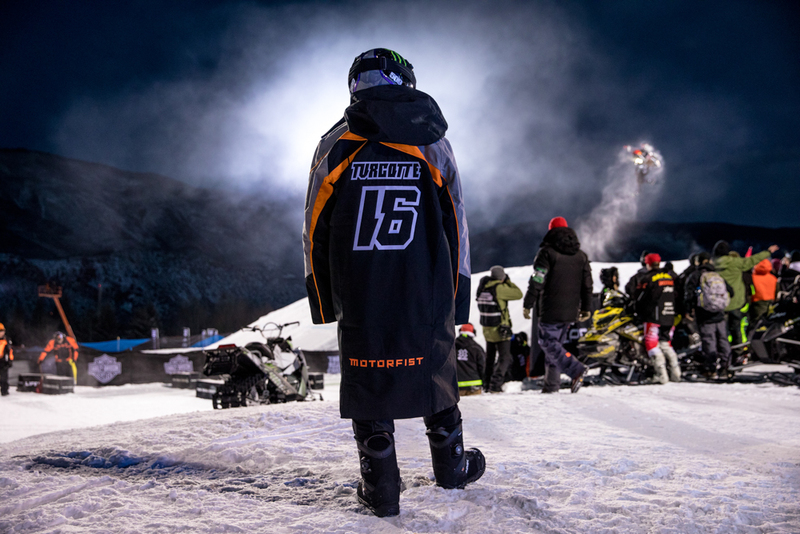 Monster Energy's Brett Turcotte claimed the top spot in Snowmobile Freestyle at X Games Aspen 2018 in a heated final session against the sport’s top riders. It must be nice to walk in Brett Turcotte’s shoes right now. 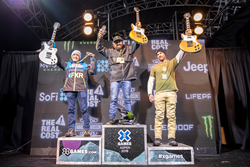 In front of a high-energy crowd at Buttermilk Mountain in Aspen, Colorado, the 29-year-old from Kamloops, Canada, claimed the top spot in Snowmobile Freestyle at X Games Aspen 2018 in a heated final session against the sport’s top riders. 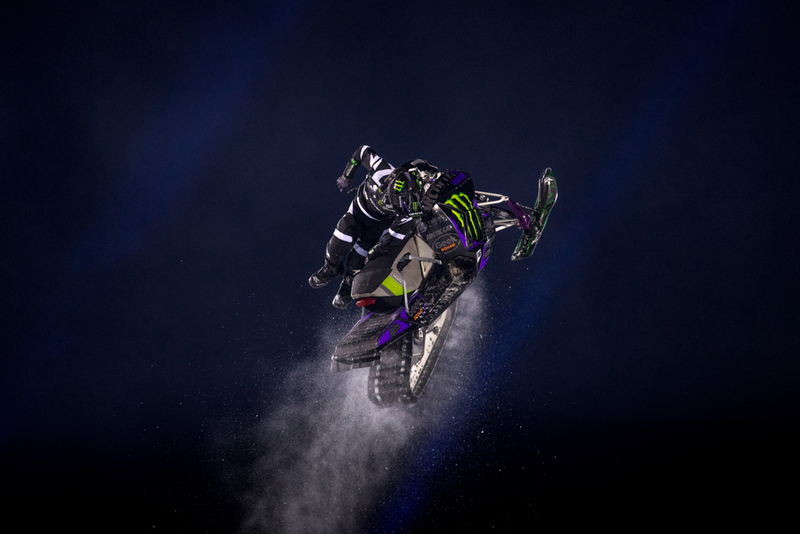 Fresh off last night’s win in Snowmobile Speed & Style, the Monster Energy teamrider is now on track to make history with a first-ever Gold medal three-peat at a winter X Games when he competes in Snow Bike Best Trick on Sunday. In tonight’s final, eight competitors took two runs each to post the highest score on the Snow Park Technologies-designed Freestyle track. Riders had a choice between launching off two Super Kicker ramps as well as an all-snow jump. As the session got going, the crowd in Aspen was treated to some new stunts never unveiled before in a competition. Having battled some heavy injuries in 2017, Turcotte came into the finals with such a never-seen-before move. 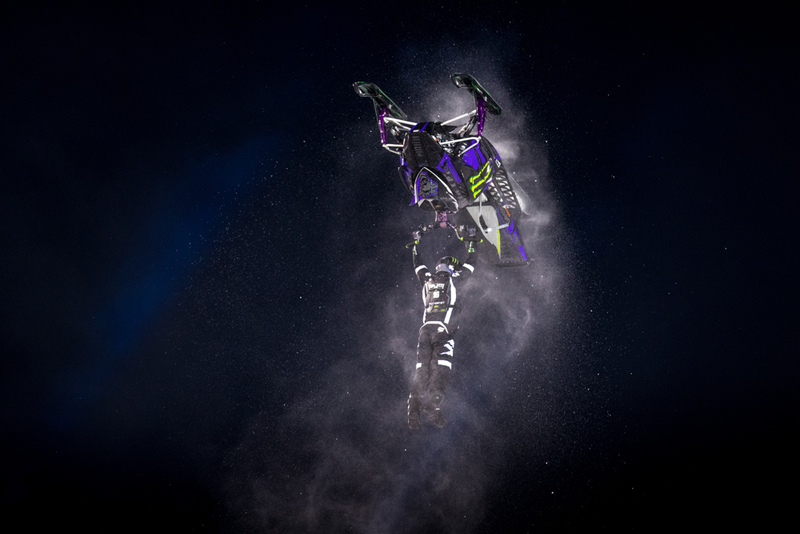 Straight out the gate, the Snocross racer-turned snowmobile freestyler pulled a move otherwise only known in motocross circles: A full Body Varial, rotating 360 degrees in his seat in mid-air, made X Games history as a move never seen before on a sled. Also known as a “California Roll,” the move started Turcotte’s run on a high note, and he followed it up by rifling off a series of tricks including a KOD Flip (short for “Kiss of Death”), Super Flip, Coyote Indy - a backflip performed hanging from the handlebar, twisting his body sideways while kicking his feet. With a high-flying backflip over the snow-to-snow jump as the exclamation mark on a perfect routine, Turcotte locked in the top spot at 90.33 points after Run 1. His close rival from last night’s Speed & Style event, Levi LaVallee, battled hard to take away the top spot, but Turcotte further cemented his lead on the second run. Raising the level of difficulty with a one-handed Superman Seat Grab and landing his upside-down moves with authority, Turcotte also blew away the crowd by adding a no-handed landing to his innovative Body Varial for a 92.00 point score and the win. Tonight’s Gold marks Turcotte’s fifth X Games medal (2 Gold, 2 Silver and 1 Bronze). He will also be competing in Sunday’s Snow Bike Best Trick and now has a shot at becoming the first athlete ever to win three Gold medals at a Winter X Games; a feat only achieved by three athletes at Summer X Games to date. 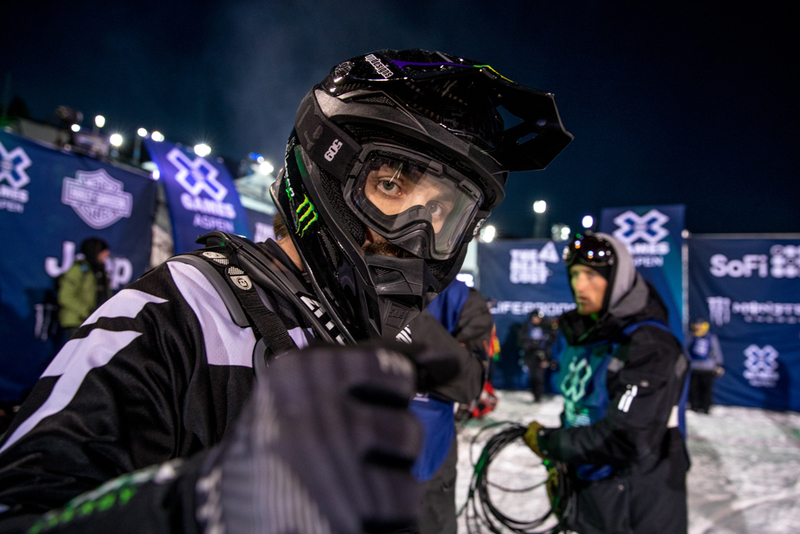 And even if he wins Silver or Bronze, Turcotte still makes history as the second rider ever to claim three medals at a single Winter X Games event. 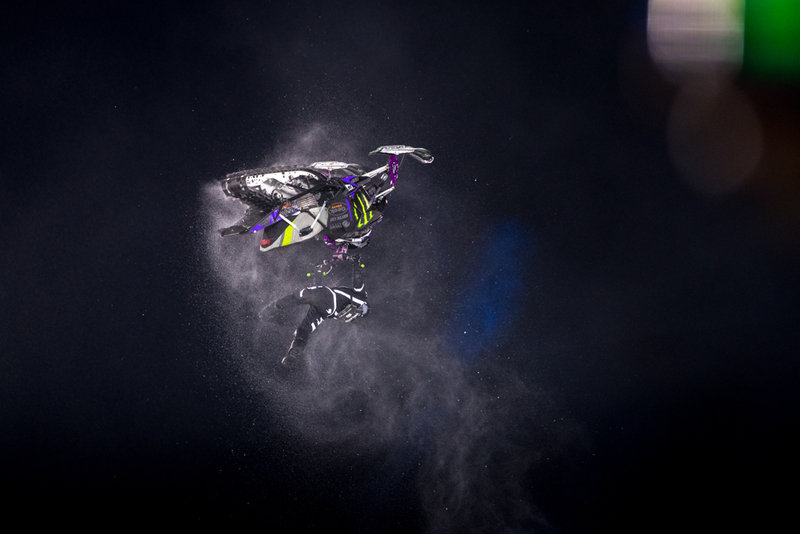 Also putting on a strong show tonight, Monster Energy’s Joe Parsons – the world’s most decorated snowmobiler with 17 X Games medals – landed a series of spectacular airs including his signature Gator Wrestler. He landed a never-seen-before Backflip Half Body Varial into a highly difficult backward landing – but after the buzzer – and had to settle for an 81.00 point score and seventh place. 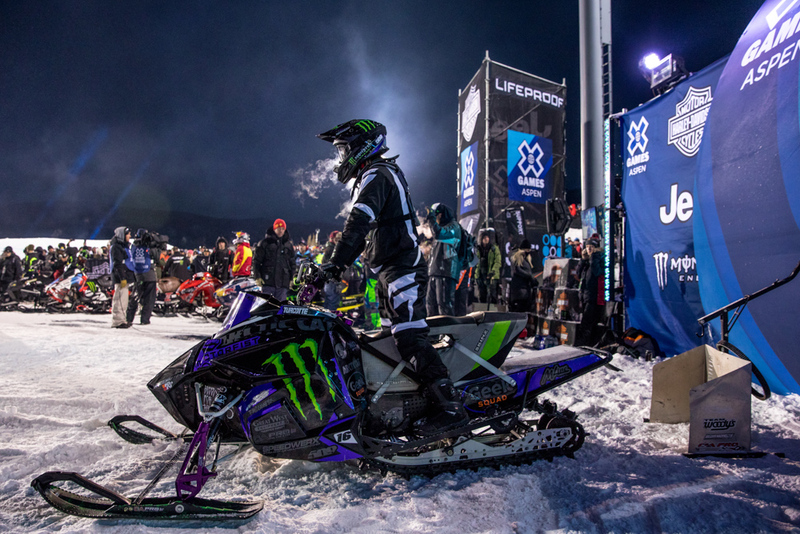 Parson’s Monster Energy teammate Heath Frisby, who could not lock down the Freestyle run he wanted tonight, will also be competing in the inaugural Snow Bike Best Trick on Sunday, next to freestyle motocross innovator and Monster Energy teammate Jackson Strong from Australia.